US ambassador to the UN dismisses Iran’s claims that the United States and its Gulf allies were to blame for attack on military parade. 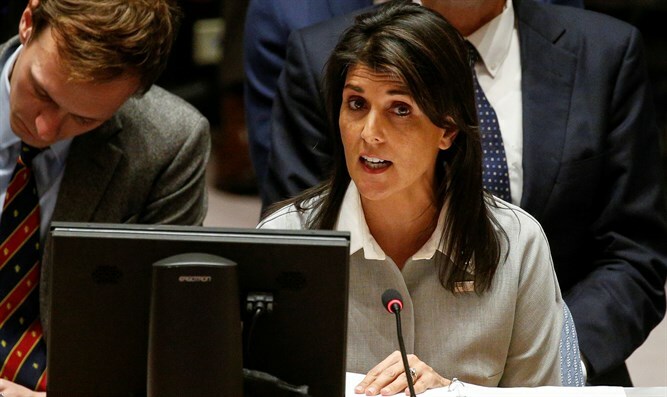 US Ambassador to the United Nations Nikki Haley on Sunday dismissed Iran’s claims that the United States and its Gulf allies were to blame for Saturday’s deadly parade attack. Earlier on Sunday, Iranian President Hassan Rouhani accused the US and the Gulf states of responsibility for the massive attack on a military parade in the city Ahvaz. "The group behind the attack was financed and received military backing from the Gulf states - and the United States supplies the resources to the Gulf states to carry out these crimes," Rouhani said, adding that Iran would "respond to these crimes within the framework of the law and international interests." “He can blame us all he wants. The thing he’s got to do is look at the mirror,” she added. According to reports in Iran, at least 29 people were killed and another 60 injured in Saturday’s attack. The Ahvaz Branch of the Arab Freedom Movement claimed responsibility. Iranian Supreme Leader Ayatollah Ali Khamenei also claimed that US-backed Gulf Arab states were responsible for the attack. “This crime is a continuation of the plots of the regional states that are puppets of the United States, and their goal is to create insecurity in our dear country,” Khamenei said. In her interview on Sunday, Haley also said that despite increased tension with Iran, the United States was not seeking regime change there or anywhere else. "The United States is not looking to do regime change in Iran. We're not looking to do regime change anywhere," she stressed. Haley praised President Donald Trump as "very strong on Iran" and described Iran as "desperate." "Iran's economy has plummeted because the President pulled out of the deal," she added. Her comments came after Trump's personal attorney Rudy Giuliani said over the weekend that US sanctions on Iran could cause a "successful revolution." Pressed for a response to the reported comments, Haley denied the US sought "regime change," but also described the relationship between the two countries in stark terms. "There is no love for Iran here in the United States, and there is no love for the United States in Iran, and both sides are going to go back and forth," the ambassador said. The State Department has said Giuliani does not speak for the administration on Iran.